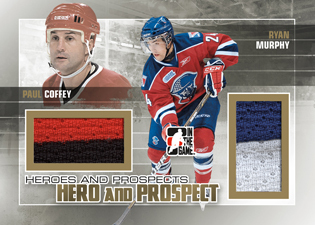 2010-11 In the Game Heroes & Prospects Update Hockey is a season-capping box set that highlights several hockey legends, recent draft picks and up-and-coming prospects. Released only in a box set format, each comes with a complete run of 50 base cards plus two additional hits: an autographed game-used memorabilia card and a game-used memorabilia card. Heroes & Prospects Update is scheduled for a mid-August release. 50-card set includes an updated roster of AHL and CHL prospects as well as new In the Game additions Eric Lindros and Theoren Fleury pictured in their junior hockey jerseys. Fleury and number one pick Ryan Nugent-Hopkins highlight the 36-card Game-Used Autograph checklist. Vezina and Conn Smythe Trophy winner Tim Thomas included in Hero Game-Used Jersey inserts along with Lindros, Fleury and Shea Weber. Hero and Prospect Memorabilia cards pair legends with up-and-coming stars. Duos include Nugent-Hopkins with Mark Messier and Ryan Murphy with Paul Coffey. Five cards make up the set. Eight Draft Star Jersey cards honor recent first-round picks from the 2011 NHL Draft. The Game-Used Jersey checklist includes ten prospects.